Any visit to my parents home in central Pennsylvania is not complete without a fishing trip or two. On this particular visit, I was set on getting the yaks in the Susquehanna River. The word Susquehanna means "broad and muddy" - ranging up to a mile wide in spots. I grew up fishing this river with my father nearly every Saturday during the summer, but have only fished it 2 or 3 times over the past few years. Unfortunately, everything I had heard about the river this summer was pretty negative. River rats were settling for 1 or 2 fish days and some even getting skunked. The combination of high temperatures and low water made many believe that the fish were pushing up into feeder creeks. Others believed that the fish were just gorging on crayfish. Despite the reports, I was set on proving everyone wrong. On Monday we decided to give it a go, despite the tough conditions. The temperature dropped over 15 degrees from Sunday to Monday including a nightime low of 50, the river was stained and slightly rising, and the wind was blowing fairly consistently. Regardless, we rounded up the yaks and my dad, my good friend Travis, and I hit the river just south of Sunbury. After taking a few minutes to get everyone situated, we were on our way. We tied on a variety of baits including spinners, buzzbaits, jigs, grubs, and senkos. About 10 minutes into the float I tossed my senko next to a giant root wad and seconds later my drag was screaming. The fish hit and immediately pulled me toward the tree. He then ran under the boat 2-3 times and did his best to shake the hook. As he breached the surface I could see that it was a nice fish. I landed him and got a weight and photos. The fish went a hair under 4 lbs - my biggest smallie in a couple of years. Although not particularly long, he was extremely thick and fat. Needless to stay, I was really excited and was thinking we were headed for a great day. Unfortunately, it was not a sign of things to come. At this point, the wind was really picking up and blowing in the same direction as the current, so staying in one place long enough to cast was tough. I lost a fish on a grub and Travis had a couple of bites as well. We fished for a couple hours more before Travis hooked up with a good fish. It immediately started dragging him downstream and he was in for his first real sleigh ride in a kayak. A minute or two later he landed an 8-10 lb channel cat that had been gorging on something. Although it wasn't a great day, it certainly could have been worse. My dad got his first taste of kayak fishing. Although he didn't get a fish, I think he enjoyed it and realized that there are some definite challenges presented when yak fishing. This was also Travis's first time in a kayak, although he often fishes from a canoe. Hopefully we get a revenge visit with the river sometime soon. Tight lines! On Thursday, Bob and I decided to hit a Piedmont flow and check out a new stretch. This stretch, which was about 6 miles long, looked pretty good on the map, so we were excited. We met around 7 AM and thanks to Bob's wife, were on the water shortly after. Within the first 5 minutes of the float, I lost about a 2 lb bass on a plastic worm and shortly after Bob landed a similar size fish. I then boated a solid bass on a spinnerbait and things were looking good. But, for the remainder of the day, the bite was streaky. I would go for long stretches getting nothing but bites from sunfish. Then I would land 3 bass in a 20 yard stretch. The highlight of my day came fairly early on when I landed my first pickerel in NC. It was 20" long and hit a plastic worm as I reeled it over a log. This was also the first pickerel we had caught in this river or ever heard was caught - at least among our acquaintances. Overall, I landed 22 bass, 4 sunfish, and 1 pickerel....not a bad mixed bag. Most bass were around 1-1.5 lbs, but there were plenty in the 2-2.5 lb range and my best fish was around 3 lbs. For this particular river, it was a poor day in terms of size. Fish were caught on plastic worms, spinnerbaits, buzzbaits, and swimbaits. Tight lines! For those of you who have yet to see it, the latest edition of Duke Magazine has been released and the Duke Bass Fishing Team (and yours truly) is the feature of the sports section. I want to re-thank Bridget Booher who agreed to write the article for us. Somehow, we even beat out a story on the Duke hoops team for the front of the sports section! The magazine is available in print and was just published online: Duke Magazine - Duke Fishing Team. We have already recieved amazing feedback from across the country including making new friends in fishing, finding some sponsors, and even having a bass boat donated courtesy of alumnus Philip van Hoy (1970). Never did we dream that all of this would occur! Oh and don't worry mom, I got 5 hard copies just for you! Tight lines! Saturday was a fun, yet challenging day on the water to say the least. I think it can be summed up pretty well by a quote from Sam Elliot's character in 'The Big Lebowski'...."Sometimes you eat the bear, and sometimes, well, he eats you." I pulled up to the launch, which granted, is in the middle of nowhere, to find a truck already parked. The straps in the back indicated I would probably have company on the water. On this small river it made me a little nervous, but I decided to give it a try anyway. I launched around 2:30 PM in 95+ degree heat. Immediately I was re-thinking my choice of an afternoon trip. Shortly after, I ran into two kayak anglers who had spent their morning fishing the stretch. They had relatively poor results, so my hopes were slightly lifted. Unfortunatley, I could tell as I fished that this small slow had been affected and the fish were skittish. I caught a fair number of fish, but nothing big. I kept moving up-river and catching decent size fish. Finally I hooked and landed a nice river bass on a weightless plastic. The next cast I had another big fish hit the bait, run me into cover, and snap my line. I was a little deflated, but no sooner did I tie on a new hook then I had another fish. It was a day with mixed emotions and some tought luck. But, I know many a lunker lurks in those waters. A return date with this spot may be in the very near future! Tight lines! It had been over 10 months since I trudged the shores of Jordan Lake in search of catfish. Catfishing is not my forte, but I love its relaxing nature and consistent bites. For me, it is always a bit of an ordeal that typically ends in sweating through my t-shirt, smelling of bug spray and chicken livers for 48 hours, having weather change in the blink of an eye and, of course, plenty of catfish action. I loaded up the car and met my friend Wendy on the way to the lake. 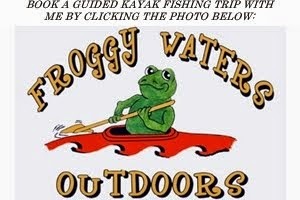 We typically fish flats and channel drops near rip rap or cover on the southern end of the lake. We pulled up to our original spot to find a father and son, so we headed for a point in slightly deeper water. After getting set-up and putting a couple of rods in the water, we had our first fish, a small channel cat, within a minute. We caught 4-5 small channel cats within the first 10 minutes - mainly on chicken livers. We continued catching fish regularly for the next couple of hours and seemingly always had at least one rod tip bobbing up and down. But about an hour and a half after dark the bite nearly died. We decided to move shallower on the flat and keep trying. At this point, we had caught tons of small mud and channel cats, but didn't have any eating size cats to show for our efforts. We reloaded our rods and threw them along the flat, which had some rip rap and grass present. This time, we rigged a couple rods with fresh cut bait, which we had not used previously. The bite immediately picked up, particularly on chicken livers and night crawlers. After landing a few small fish we finally got a decent size channel cat on a piece of cut bait. Then, 30 minutes later, we landed another good size channel...at least we wouldn't go hungry! We fished into the early hours of the morning, conversing about a variety of topics, doing a lot of laughing, and reeling in fish with decent regularity. Eventually, Wendy ran out of time and the bite slowed, so we packed it in and headed back to Durham. I would estimate that we caught 40-60 catfish, but couldn't get any bigger bites and only kept 2 to eat. We tried using hot dogs, night crawlers, fresh cut bait, and spam (which was tough to keep on the hook) throughout the night. My typical way to rig these baits is a 3/4 oz. to 1 oz. sinker rigged above a swivel on a carolina rig. I typically use #2 and #4, red, Gamakatsu cirlce hooks and occassionally size 4-6 Gamakatsu straight shank baitholders. On most of my rods, except a big bait rod, I use 8-12 lb test line. It was a really fun night and great time on the water. I want to thank Wendy for making it a very enjoyable trip. I am glad you could join me on the water...we need to do it again soon! Tight lines! Sunday a new friend, Jason (from RiverBassin.com), and I met up to tangle with some Piedmont bass. Jason is a graduate student at UNC and although he wore a UNC shirt, he left his ugly shade of blue at home. We met up in the late morning and were eager to fish. Unfortunately, the river that was our first choice looked like chocolate milk. After giving it some thought, we headed to a nearby river full of spotted bass. It was stained, but clear enough to fish. We were on the water around 11:15 and casting away. Despite the recent rains, the river was low and rocky. We fished hard with spinnerbaits, swimbaits, buzzbaits, and plastics for the first hour or two with very few fish to show for it. Finally, we found a couple patterns and some good areas and the bite turned on. My best 2 fish came late in the day and my 3rd 'limit' fish came less than an hour prior. They measured 14 1/4", 14", and 13 1/2" respectively. The two biggest came on a Lucky Craft Gunfish 95 in chartreuse shad and the third was caught on a white Cavitron buzzbait. We fished until about 5:30 or 6 PM and landed somewhere between 50-60 bass between us. We also had countless more short strikes. We were hoping to add a largemouth or striper to the mix, but it wasn't meant to be, as every fish was a spot. It wasn't exactly the day we had imagined on the water, but we were glad to have caught good numbers of fish. Plus, I made another new friend on the water. Sorry, no pictures today....nothing big enough to shoot.